The Manchester Terrier has 134 years of recorded history. It is one of the 12 breeds first recognised by the Kennel Club when it was formed in 1874. It was then called the Black & Tan Terrier. 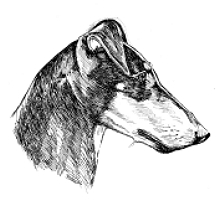 Bewick in his “History of Quadrupeds, published in 1790, says that there are two types of terrier, the rough coated short legged one and one that is “Smooth, sleek and beautifully formed, having a short body and a more sprightly appearance…..black with tanned legs.” That exactly describes the Manchester Terrier then and now. The Manchester Terrier is always black & tan, in the long history of the breed, no other colour has been listed. In the 1800’s terriers performed in the rat pits, their owners betting that their dog could kill a stated number of rats in a given time. The most famous was Tiny, the Black and Tan, owned by Jemmy Shaw a retired boxer, who owned the Blue Anchor Tavern in Whitehall, London. She was recorded as killing 200 rats in an hour. Several breeds of dogs were created with the Manchester Terrier in their origins. The Doberman being the most famous, but the Whippet is said to be one and the Bull Terrier another. The Manchester Terrier is an urban dog, keeping down vermin in homes, ships, mines and warehouses. He is not built nor has the coat to go to ground like the short legged rough coated terriers. The modern dog has lost none of its working instinct. It works alone, not in a pack and silently. No vulgar barking and wrangling for him. He has a ‘soft’ mouth, killing the rat or mouse with a shake, breaking its neck, casting it aside and then going on to the next one. He is a natural athlete with a single coat, easily kept clean with no doggy smell. He is also the best burglar alarm there is. The breed has been exported all across the world, particularly America, where the breed is known as the Standard Manchester Terrier, as opposed to the Toy Manchester Terrier. The breed has always had a following in Germany, hence Herr Doberman knowing about them and using them in his breeding program to create the Doberman. They are now becoming popular all across Europe and in Australia etc. It is however a minority breed everywhere. Only about 150 a year are bred in the UK as opposed to 45,000 Labradors. The breed becomes an addiction with its owners. This breed of dog is a 'Vulnerable Native Breed'.